The thing I love most about christmas is that, for me at least, it is just a great excuse to sit and indulge in crochet for days on end! Ok there may be the odd gift to wrap and turkey to baste but amid all the hub hub I always manage to find time to work with wool and those that know me well would say this is a gross understatement! So, I was wondering around Pinterest as we visually creative folk do and came upon a blanket worked in basket weave crochet stitch and immediately fell in love! What captured my imagination was that it can be worked using all those old scraps of wool that accumulate over time. The blanket above (which now resides in my B&B room for guests to enjoy) became a labour of love and has seen me through the darkest months. Being someone who struggles with a mild dose of SAD I have found this project incredibly therapeutic. None of the colours were pre planned I simply did whatever colour I felt the urge to work with at the time and I think this way of working with colour can be very beneficial to the soul. So what you see before you is my winters journey! 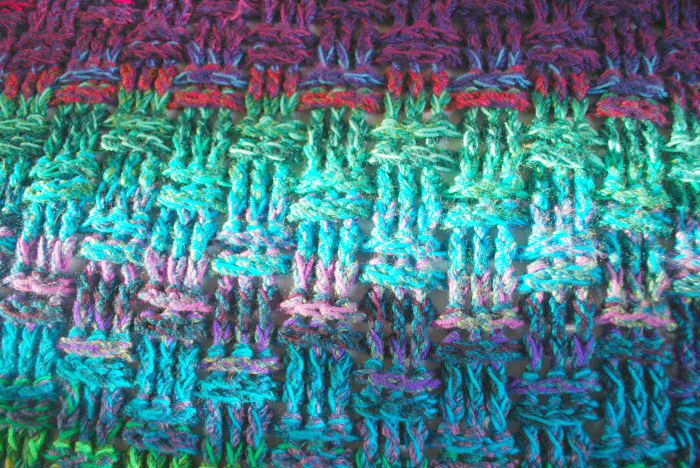 For this particular blanket I used my stash of James Brett Chunky Marble Acrylic wool as the foundation for the blanket and mixed in one or two strands of additional colours as I worked each row. If you ever come to one of my crochet workshops this is the wool you will be given to get you started. To begin you need to gather your wool stash and work up to 3 strands together changing colours as and when you please. For my basket weave crochet blanket I used a 9mm crochet hook throughout working loosely which allows the blanket to grow quickly. Row 1: Turn your work and into the *third chain from the hook*. Work back along the chain working a total of 120 trebles. Row 2: Turn and chain 3 (counts as your first treble) work next 2 trebles into the front of the next 2 stitches. ( Front Treble Crochet = FTC) Now work your next 3 trebles into the back of the following 3 trebles (3 Back Treble Crochet = BTC) Repeat to the end. Row 4: Turn and chain 3 (counts as first treble) now we are going to reverse the order so work next 2 trebles into the BACK of the stitch (BTC) and the next 3 trebles into the FRONT of the stitches. Repeat this pattern to the end of the row. You should now begin to see the weave effect emerging. Continue to your hearts content!